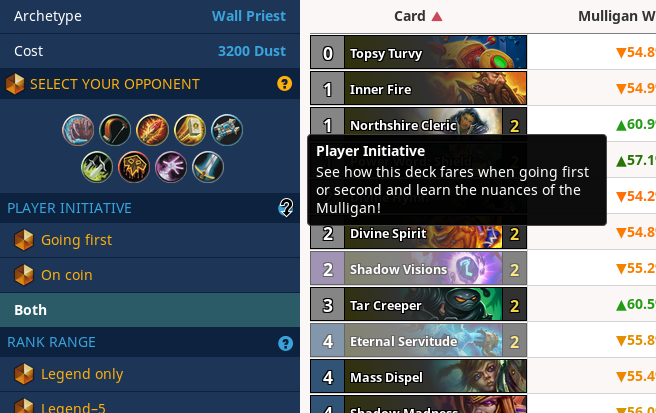 The HSReplay.net team would like to announce their newest feature: the Player Initiative filter! At the start of every ranked match in Hearthstone there is one player that goes first, and one player that receives the coin and an extra card. While these respective advantages mostly balances out the global advantage of going first, some decks benefit more from their preferred advantage over the other. While you can't control which advantage you'll be getting when building, selecting and queuing with a deck, you can adjust your decisions in game accordingly. Our Mulligan Guides on HSReplay.net have been available since early on when we launched the statistics section, but we have so far not been differentiating between which advantage a player a had. You'll find this new filter on all single deck pages on the site. Check out this Zoo Warlock or this Quest Mage. While this is one of our most nuanced filters yet, we hope that publishing the data allows players to learn their decks inside out and enhances their intuitive understanding of the game. Don't forget to sign up for Premium to have access to this filter and the full breadth of stats from HSReplay.net, including mulligan guides, personal statistics and more. Follow us on Twitter and Facebook for daily Hearthstone stats. Hey! I'm one of the HearthSim Founders and mostly work as part of our engineering team.